It was announced today that Fine Arts Film Studios and the Utah UFO Hunters organization have joined together to produce a two hour documentary on sightings of unexplained phenomena throughout the State of Utah. investigators to possibly be the most mysterious place in the world. Filming will begin September 15, 2004 in Duchesne and Uintah counties. or Tom Black with Fine Arts Film Studios at 1-435-623-5555. FACT: Utah has more reported Bigfoot sightings than Washington State,California or Oregon! UFO Hunters are heading to the basin to guide a Utah film maker to areas where oral and written history shows there has been some rather strange occurences in the past. 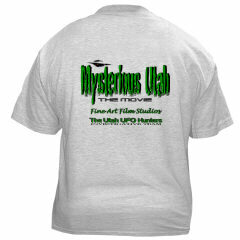 Dave Rosenfeld Executive Director of Utah UFO Hunters ( UUFOH ) and his forty associates has teamed up with Fine Arts Film Studios to produce a documentary titled "MYSTERIOUS UTAH." The two hour video will cover a long list of unexplained phenomena including crop circles in Logan and Cache counties, statewide Bigfoot sightings ( Utah has more Bigfoot sightings individually than does Calfornia, Oregon or Washington States ) , unexplained lights of various colors and shapes , UFO's, Cattle disappearances and mutilations ,unexplained depressions in the ground and bizarre looking creatures. Many Utah residents who have had "close encounters" will be interviewed. One half of the video will be devoted to what Director Rosenfeld and many other paranormal investigators consider to be the most mysterious 480 acres in the entire world commonly known as the 'Ranch ". Located between Roosevelt and Randlett the former cattle ranch was formerly owned by Terry and Gwen Sherman who sold it to Las Vegas real estate tycoon Robert Bigelow in 1996 for an estimated one quarter of a million dollars. Interviews with Mr.Sherman reveal that just about every known kind of unexplained activity regularly occurs on the property. Bigelow fenced the land and created a scientific research center titled the National Institute of Discovery Science ( NIDS ) . It is unknown what Bigelow's staff has discovered but UUFOH investigators have observed unusual activity from their observation post outside the property. It has been said that an artist's responsibility is to interpret the world and share that interpretation with society. According to the members of Cydonia Effect, that responsibility is to be respected even though the interpretation may not be. The music of Cydonia Effect is best explained as a step forward in the movement commonly referred to as alternative/experimental, combining psychoactive soundscapes with solid musicianship the trio create an atmosphere of hypnotic grooves while retaining a strong flow of modern hard rock, which gives their shows both energy and ambience. The band began as a side project between three solo artists from a secluded area in northeastern Utah. They came together in early 2004 for live performance and improvisation, and have since developed a genuinely unique sound and style. Cydonia Effect are multi-instrumentalists, so there is no fixed line-up, rather, the band prefers to alter instrumentation and lead vocal throughout their sets, which include much original material and a variety of obscure, and not so obscure covers. Aside from live performance, the band are recording constantly and have produced scores/sound tracks for independent film makers. Cydonia Effect are looking forward to releasing an L.P. in the near future, and touring in support of it.